Medibrane’s unique technology, Sutureless lamination, was developed by our team of experts, following an ongoing journey to better understand medical device clinical requirements, as well as the Biomedical industry. 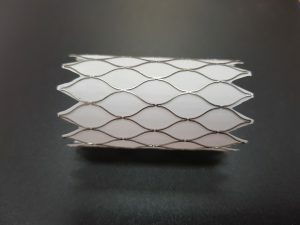 This new and advanced technology enables the replacement of the suturing technique with a novel solution that makes it possible to cover stents or implants by fabric using a repetitive, reliable, fast, and easy to manufacture process, yielding high quality products. Covered stents, such as abdominal aortic aneurysm vascular stents, or gastrointestinal tract non-vascular stents, are mostly covered by fabric (such as; Polyethylene terephthalate or Polyester) or graft material (such as polytetrafluoroethylene – PTFE) fabric covers are also commonly used in structural heart devices, such as; heart valves, left atrial appendage devices, mitral valve clips, etc. The advantage of using covered stent over bare-metal stents varies from fluid directing needs to tissue in-growth. The advantages of a fabric cover derive from its porous structure that enables both sealing and tissue in-growth. The disadvantage of such a covering material derives from the same quality, the pores, which can lead to blood clot accumulation. This is the reason fabric covers are usually not used in vascular stents designed for small blood vessels. Till today, one of the disadvantages of using fabric covering was the technology in which it was implemented onto the medical application, suturing. Suturing is a manual, non-automated, time-consuming procedure. Medibrane’s experts overcame this challenge, and, using our unique Adhesion platform, developed a new technology, in which the fabric can be laminated to the stent without the need of sutures. Medibrane’s Adhesion platform was developed in order to improve adhesion between the metal stent or frame-based application, and the coating, knowing this is a character that will ensure the cover’s long term attachment. Based on this advanced platform Medibrane’s experts developed the innovative Sutureless lamination technology, enabling good adhesion and eliminating the need for sutures.